Waterford Institute of Technology (WIT) has announced its President’s Scholarship scheme is to run for a second year. The scheme encourages and rewards inspiring young people who show a capacity to shape a better society. Five exceptional people are awarded scholarships with a total value of up to €12,000. Scholarship applicants must have listed one of WIT’s 70 CAO courses as one of their choices on their CAO application before applying. If they haven’t yet listed choices, they can do so ahead of the scholarship deadline while the CAO change of mind facility is open between 5 February and 1 March. The closing date for President’s Scholarship applications is Friday, 7 April at 5.15pm. WIT President Prof Willie Donnelly said that WIT welcomes applications from prospective students who are inspiring in their actions and behaviours. 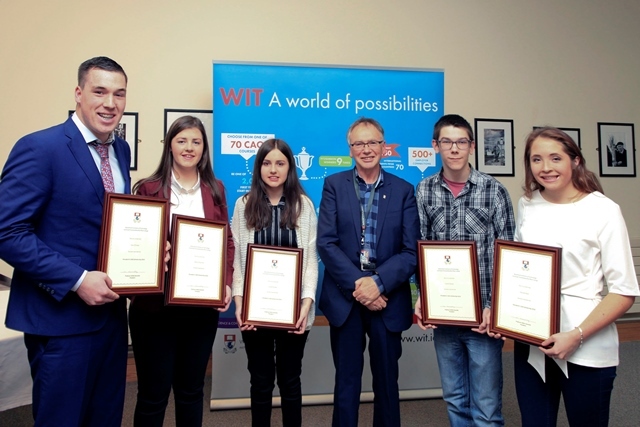 The inaugural recipients of WIT’s President’s Scholarship programme were recognised at a ceremony recently. “The President’s Scholarship recognises and rewards young people for their leadership in their community. Having met the recipients of this year’s awards I was strong from their energy and enthusiasm. They bring a very special dynamic to WIT which benefits the Institute and their fellow students,” he continued. Louise Dunphy, Bachelor of Business (Honours) from Waterford who has participated in the arts and cultural sector. Gareth Dineen, BEng (Honours) Mechanical & Manufacturing Technology, from Tramore, Co Waterford who has an affinity for technology and would like to work for the European Space Agency. Hannah Nash, BA (Honours) Exercise & Health Sciences, Monkstown, Co Dublin, plays camogie and football for Cuala GAA club in Dalkey and is former head girl of Coláiste Íosagain in Co Dublin. Cian O’Grady, BA (Honours) Social Care Practice, Herbertstown, Co Limerick, earlier this year won the Pramerica Spirit of Community Awards. He is working on a social enterprise that would help the homeless. Róisín O’Donnell, BSc (Honours) Agricultural Science, Poulmucka, Clonmel, Co Tipperary who is currently working towards her gold Gaisce award having already achieved both bronze and silver and works part time with the Farm Relief Services when not helping out at home.